There are certain times that make me proud to live in Washington, DC. One of them, which happens every year, is Memorial Day weekend. 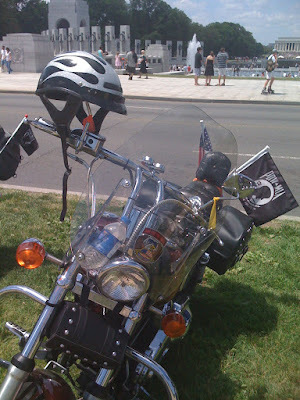 Its a holiday where American war veterans from all over the country descend upon the National Mall and the surrounding area, many of them arriving via motorcycle to participate in the Rolling Thunder parade. Their presence brings the war memorials and monuments to life, as these are the men who served with those Soldiers who are memorialized here. Each and every one of the thousands who have completed their pilgrimage to the District brings with them memories and stories that those of us who have never served will never fully understand. I spend a lot of time on The Mall, as it is one of my favorite places to go for a jog, but it always looks its best on Memorial Day. 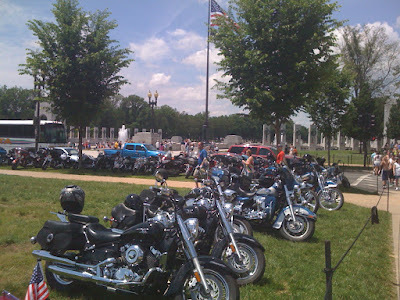 I arrived on The Mall today yet again taken aback by the number of motorcycles that were there. 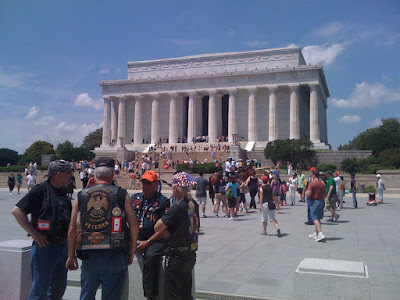 In every direction, as I approached the Lincoln Memorial, there were bikes parked in straight rows on the grass and bikers riding them in formation in the streets. It actually reminded me of a being at a Phish show where there are so many of them, who would typically stand out on a normal day. 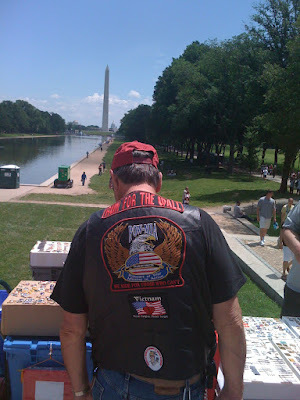 Today, it was the bikers, with their leather vests, embroidered patches, and pins who were the norm, among their brethren, claiming the Mall as their own. Below are some pictures I took today with my iPhone. 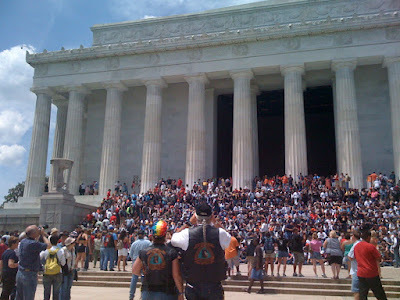 The last one is a shot of gathered veterans taking up every inch of the Lincoln Memorial steps. It was pretty moving to see them all there looking out over the reflecting pool, Washington Monument, World War II Memorial, Vietnam Wall, and Korean War Memorial. With the release of their new album 'Big Whiskey and the GrooGrux King' coming up on June 2nd, Dave Matthews sat down for an interview with Entertainment Weekly where he explains that the band nearly broke up a couple years ago, before LeRoi Moore's ultimately fatal accident occurred. He feels that the band had started to lose itself way back in 1998, during the recording of 'Before These Crowded Streets', only just recently finding its way. This is very interesting to read 11 years on, as I'd been a huge fan of DMB in the mid-90s and gone out and picked up 'Before These Crowded Streets' as a sophomore in collge as soon as it was released. I remember listening to it in the dining hall on my Discman and thinking that it lacked some of the magic of prior records. While there are some very good tracks on it (Dreaming Tree), many did not meet the high standard that I'd set for the band after 'Under the Table and Dreaming' and 'Crash' had set the soundtrack for my high school years. Any album material I've heard of theirs since then, aside from the fantastic Matthews solo debut 'Some Devil', none of which I have purchased, hasn't sounded like the same band I had come to love previously. So if this new album is in fact a return to form of the mid-90s for the band, it would be very welcome from me. I'm looking forward to hearing it. Probably won't buy it though. Read the EW interview here. I've had the pleasure of knowing for the last year and a half that there was a plan to have Trey Anastasio perform a concert with the Baltimore Symphony Orchestra (BSO). One of my best friends and college roommates, Toby, happens to be the facility sales manager at the BSO. Toby and I have seen dozens of Phish shows together and I specifically remember when he originally told me about this idea sometime in 2007. Well, after countless months of planning, he finally pulled it off. The concert took place at the home of the BSO, The Joseph Meyerhof Symphony Hall, near the trendy part of Bolton Hill, just north of downtown Baltimore. I had been looking forward to this concert for a long time and I knew we were in for a special performance. The hall itself holds about 2000 people and I felt privileged to have such a great seat in a small and intimate venue. I arrived to the venue about 45 minutes early with a familiar anticipation. It almost felt like I was back in the lot passing by shakedown while being offered veggie burritos, hemp necklaces, and a pharmacy of recreational items. Walking into the venue was almost confusing. As I glanced around I saw dreadlocked hippies, preppy yuppies, and folks who probably thought they were there for another night at the symphony. The music of a live bluegrass band filled the background with industry standards and some good pickin'. I headed over to the bar and met some friends as we talked up what the possibilities of the evening were to be. As the lights flashed we headed to our seats and the concert began. Once the orchestra got settled, Trey walked out to an eruption of applause and cheers. You could tell that the orchestra was probably not used to this excitement over guest musicians. The crown was very excited as they shouted out Phish songs amongst other nonsense. With a big smile on his face, he strapped on his guitar and strummed the opening chords to Divided Sky. 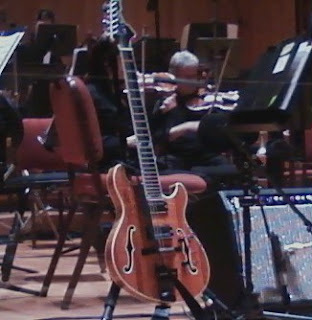 The orchestra complemented his playing nicely, although I felt the volume on his guitar could have been a bit louder. Fortunately, this balance improved dramatically as the night went on. Once Trey settled in a little bit, it was a flawless performance. The first set consisted of all Phish songs including Brian and Robert, The Inlaw Josie Wales, and an emotional Water in the Sky which Trey dedicated to his sister that recently passed away after a long struggle with brain cancer. One of the high points of the set was an intense version of First Tube. The orchestra was loud behind him and Trey got a chance to turn up the distortion a little bit. You could tell that he was really enjoying being up there. After a quick intermission we were treated to "Time Turns Elastic", a new arrangement co-written by Trey and arranged specifically for a symphony performance. The movements glided from one section to the next and in addition to the instrumental parts their was some singing too. I wouldn't be surprised if parts of this end up on Phish's new album. The set ended with a familiar version of Guyute that can be heard on one of Trey's solo albums. After coming out for an encore, the show ended with a beautiful version of the Phish ballad If I Could. The song choice seemed appropriate since there is a backing string section on the album version of the song. Once the song ended, Trey came out a few times for some post encore bows, but finally the house lights came up and we knew the concert was over. As I filed out amongst my friends, you could tell that people were impressed and it had been a satisfying scratch for the Phish itch. All I can say is that its only 16 days till I see Phish in Camden, and this was a pretty good warm up to get me in the mood. Congrats to Toby for having such a great vision and being able to finally execute it. * In Memory of Kristy Manning, dedicated to her surviving son Jason. On June 13, 1997 Phish kicked off their summer European tour with a 2-night run at the SFX Centre in Dublin, Ireland. This show is most well known as the night they debuted seven new original songs, but they also debuted two new covers during the encore. These were Sly and The Family Stone's 'Stand!' and Jimi Hendrix's 'Izabella'. The band would never play 'Stand!' again, but 'Izabella' appeared in setlists a total of ten times, lastly in 1998. Phish played 17 shows on that Summer '97 tour of Europe, including appearances at the Glastonbury festival in England and the Roskilde festival in Denmark. They returned to the US and commenced a stateside tour in July that saw them step out as a very different band from what fans their were used to. This was the beginning of Phish's darker funk era that would ultimately show up on record with 1998's Story of the Ghost album. 'Stand!' appears on Sly and the Family Stone's fourth album and shares a name with the album it was released on. The Stand! album, #118 on Rolling Stone's 500 Greatest Albums of All Time, was released on May 3, 1969 and peaked at #22 on the charts. Also on this album are well known tracks 'I Want To Take You Higher' and 'You Can Make It If You Try'. Three months later, the band went on to perform at the legendary Woodstock festival, with their performance being one of the highlights of the festival's movie. In the months and years after the Woodstock festival, Sly Stone began his descent into heavy drug use, abusing cocaine and PCP. The band and Sly would never be the same again. Sly and The Family Stone continued to release music and tour throughout the early 70s, but most nights, Sly, if he even showed up at all, would give lackluster performances. The band officially broke up in 1975. From the 80s through to the mid-2000s, Sly Stone remained in seclusion and mostly out of the public eye. On February 8, 2006 a Sly and the Family Stone tribute took place at the Grammy Awards. Even though Sly did take the stage with the Family Stone for the first time since 1971, he only stayed on stage for a few minutes and turned in a bizarre performance that was generally inaudible over the backing band. Having been severely let down by the Grammy performance and reading generally negative reviews of Sly's sporadic appearances on stage since then, I was entirely surprised to find this gem of a video on YouTube featuring Sly Stone singing the aforementioned 'Stand! ', taped at the Tokyo Jazz Festival on 8/31/08. Featured here is the Sly I was so hoping to see at the Grammy Awards. His voice is still in tact and he really appears to be enjoying himself at the piano. I'm so happy to have found this video and I hope you enjoy it as much as I do. As the next installment in our series of exploring the original versions of songs that Phish has covered in concert, I present to you Little Feat performing 'Skin It Back' live from the Netherlands Pinkpop festival in 1976. 'Skin It Back' is on a short list of Phish-played songs that never made it out of the 80's. It was performed by the band only seven times, first appearing in their repertoire on 10/15/86 at Hunt's in Burlington, segued into Talking Heads' 'Cities'. This concert was notable in that it was Paul Languedoc's first turn as sound man. 'Skin It Back' has not appeared in a Phish setlist in 1,126 shows. 'Skin It Back' appears on Little Feat's fourth studio album Feats Don't Fail Me Now released in 1974. Paul Barrere takes the lead vocal in this song, with Lowell George stepping up for a lead guitar solo. This tune did not appear on the original release of the legendary Feat concert album Waiting For Columbus, but it did ultimately appear on the 2002 "Deluxe Edition". Pinkpop is considered to be the oldest annual festival in the world, with its beginnings in 1970. Playing the first annual edition was Dutch "Radar Love" band Golden Earring (they returned to play the festival 35 years later in 2005). Appearing at Pinkpop the same year as Little Feat were Uriah Heep and The Chieftans. The countdown to my first Phish show in over six years is now set at 21 days! It is with sadness that I am reporting the death of Texas guitarist Stephen Bruton at the age of 60. He died of complications from throat cancer at the home of T Bone Burnett, with whom he had recently completed the recording of music for a movie. Stephen was most famous for being Kris Kristofferson's touring guitarist for over 20 years starting in 1970. His latter career songwriting success is evidenced by his works being recorded by Kristofferson, Bonnie Raitt, The Highwaymen, Willie Nelson, Waylon Jennings, Johnny Cash, Little Feat, Jimmy Buffett, Patty Loveless, and Martina McBride among others. Bruton and Burnett had been friends since their teenage years. It was only just a couple months ago that I again checked on his tourdates hoping that I would get to catch him live sometime soon. I was first introduced to Mr. Bruton a few years ago when I heard a song of his on XM radio. It is a song that I saved to my portable satellite radio device and one which I have gone on to listen to dozens of times since. It is easily of my top ten favorites that I've recorded from XM. The song is called 'Fading Man' and it appears on Stephen's fifth solo album "From The Five". In a 2008 Glide Magazine poll "From The Five" was listed as a Best Album by Ratdog guitarist Mark Karan. To close her Mother's Day performance in Austin, TX, Bonnie Raitt, with tears streaming down her face, played Bruton’s “Too Many Memories." This is an old Mustangs song, originally written by Cyril Ferguson. Mike went on a Carribean vacation and saw the Mustangs perform in Freeport, then bought the album (tape?) and brought it home. "Ya Mar" (sometimes written "Yamar" by fans) was on the tape (purportedly the only tune on it worth covering), though the Mustangs are guessed to have covered it from someone else. This tune can also be heard on Mike Gordon's collaborative release with Leo Kottke, Sixty Six Steps. Notably, the album contains a cover of the Pete Seeger tune "Living in the Country." It all comes full circle. Billboard posted a video today that comprises artist interviews about Pete Seeger and also being asked to play his 90th birthday concert. Enjoy a short clip of Dave Matthew's performance from last night. Springsteen and Tom Morello perform a haunting "Ghost of Tom Joad"
Dave Matthews steps out solo for the traditional "Rye Whiskey"
The ensemble of Kris Kristofferson, Ramblin' Jack Elliot, Warren Haynes, Richie Havens, Taj Mahal, Keller Williams, and the Saturday Night Live Band take on Dylan's "Maggie's Farm"
Last night, MSG hosted a (surprisingly) very well-coordinated and touching tribute concert to honor the 90th birthday of legendary folk hero and American patriot, Pete Seeger. Guests ranged from Bruce Springsteen to Ani DiFranco, Richie Havens to Bruce Cockburn, Dave Matthews to John Mellencamp, and Ben Harper to Joan Baez. It was quite moving -- even tear jerking at times -- to watch these artists collaborate for the sole purpose of celebrating the career of one of the last true national icons. Over the course of the evening, we heard former Byrds frontman Roger McGuinn sing 60's anthem "Turn! Turn! Turn!," Havens play the obligatory "Freedom," and Springsteen pay his own personal homage to Seeger with "The Ghost of Tom Joad." Frequent performers included Tom Morello of Rage Against the Machine (who contrary to my original thoughts was quite impressive), the ubiquitous Warren Haynes and of course, Arlo Guthrie, the son of Seeger compatriot Woody Guthrie. We watched the sprightly DiFranco and a raspy Kris Kristofferson perform a playful rendition of "There's a Hole in my Bucket." Rufus Wainwright blessed us with his heavenly vocals on a number of tunes, while actor turned activist, Tim Robbins, offered a heartfelt dedication to the life and times of the 90-year old songwriter. Dave Matthews performed a, well, Dave-esqe rendition of "Rye Whiskey" and Bela Fleck and Tony Trischka banjoed-it-up on stage throughout the night. While I'm certain there were a number of celebs in attendance, I can personally vouch for at least one -- Mike Gordon -- who I did spot amongst the crowd. I have to think that Seeger's own feisty environmentalism (see Hudson River Sloop Clearwater) influenced the charitable endeavors of countless other bands, including Phish's own Waterwheel Foundation. It's a shame Jerry Garcia isn't still alive (for so many reasons) because I think he would have undoubtedly participated in this celebration of life, liberty and music. 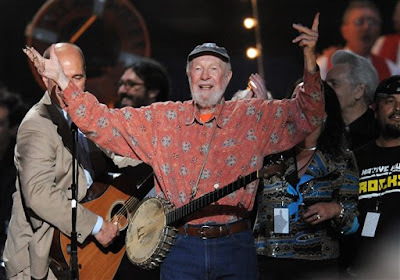 But the true highlight of the evening was when Seeger himself led the audience of roughly 20,000 in an emotional rendition of "Amazing Grace" that had everyone chanting the hymn in unison. His weathered voice -- barely able to squeak out the notes -- had tears welling my eyes. It was at that moment, Seeger proved that while his frail body is in its hour of twilight, his soul will peaceably live on forever. Happy Birthday, Pete. Roughly 30 days away from my first Phish show in about a decade, I'm starting to get the itch. So, in the weeks before this momentous occasion, I thought it would be fun to countdown with some of my (and the other Weightstaffer's) favorite tunes covered by Phish, or Phish tunes covered by others. Leading off is probably my favorite in the Phish bluegrass repertoire and an all-around American classic -- "Uncle Pen," performed by the legendary Bill Monroe. I hope to catch this one live during the summer run. According to Deaddisc.com, "Uncle Pen was named for Bill Monroe's uncle, Pendleton Vandiver who Monroe described as; '.... one of Kentucky's old-time fiddlers, and he had the best shuffle with the bow that I'd ever seen, and kept the best time. That's one reason people asked him to play for the dances around Rosine, Kentucky. In his later years he was a crippled man. He had been thrown by a mule and had to use crutches the rest of his life. My last years in Kentucky were spent with him.'" If you have a favorite Phish cover you'd like to see here on The Weight, drop us a note, and we'll gladly post it for you...assuming we can find it!